Hello friends! 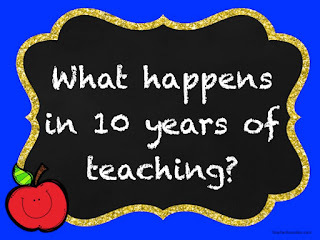 This month marked the beginning of 10 years of teaching. After my 10th "First Day of School" as a teacher I couldn't be happier! I've been writing this post in my head for a month now. I disappeared from blog-land temporarily, but it was for fantastic reasons. I wanted to take a moment to reflect on my career as a teacher. This month I feel like all my hard work and the many struggles to bring me where I am today have finally brought me to a wonderful place. What am I doing? Wait, that didn't take 30 minutes and you're all done in 10? Hold on this little thing takes an hour?? I was fresh out of college and teaching in a rough part of Phoenix at a fantastic school with amazing staff members and mentors. I loved having my own class, but there were definitely a few kinks to work out. I also went to bed at 8:30 almost every night. I spent many evenings on my living room floor with my roommate as I convinced her to help me color and cut out laminated centers activities. I also learned that while I became a general ed teacher, I really liked working with the ED kids (emotionally disabled) as they were mainstreamed into my class. So you want to teach 2nd grade again? Too bad we need you in 1st grade and you're the newbie so you don't get a choice. Do you know what happened? I fell in LOVE with first grade! I started to get my bearings as to who I wanted to be as a teacher and lesson planning only sometimes took forever and ever. I love my school! Can I just take it back to Cali with me?? This was a lovely year for me professionally, but my life outside of school took a sad turn. It's funny how the path you think you're on can suddenly change and you think it's for the worst, but it ends up leading you some place wonderful. Back to Cali, Cali, Cali! I'm from the Bay Area and the center everything exciting: city life, wine country, beaches, and the tech capital of the world. Sadly, I got here when the economy crashed and there was a shortage of teacher jobs thanks to budget cuts. It was impossible to get a public school job that year. Thanks to Craigslist (weird, I know) I got a job at a private school for high functioning kids on the autism spectrum. These kids always held a special place in my heart and I was so excited to work with them. 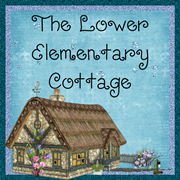 I taught "lower elementary" which meant 1st/2nd grade with varying diagnoses of high functioning kiddos. Why didn't I go into special ed to begin with? Well, who says I can't? Time to get my Master's degree! I basically stopped having a life for a year as I taught kids with autism all day and went to grad school at night. After a lot of stress headaches it was totally worth it! I had my second degree and credential. Those kids I taught? Still love them! What do you mean grad school is over? I'm not good at being lazy, so why don't I go to Stanford and get my CLAD (English language learner) certification? I still had a great group of kids with 1 that worked my every nerve, mostly because I had little to no support with a kid with much higher needs than our school could handle. This was the year I learned you can love every kid, but not every kid belongs in the same class with only 1 teacher in the room. Did you know it's possible to teach 3 grade levels at once all day, every day...for an entire year? Neither did I! But somehow I survived. I had great kids, but with 2 kindergarteners, 1 genius, 1 first grader, and 1 second grader... teacher life wasn't easy. Thankfully they all had fantastic families who made my life a million times easier. By the end of the year I was fried and decided it was time to move on to new professional experiences. My dream job is available?! And I'm hired?! Yes! So all those years of teaching kids with autism needs to shift into an expert in dyslexia? Ok, sure no problem. I got this. It was also the first year I ever had a teaching partner and had to share my classroom, which was an interesting experience, but we made it work. I learned what it's like to expand my skills to more than just teaching kids. I was given wonderful new opportunities including teaching a seminar about dyslexia to parents and educators. Do I want to go back to school for certification #4?? Sure! Why not? My school enrolled me in the Wilson Certification program which is a full year worth of coursework and practicum. Did I mention I had a class full of rambunctious boys who were never described as "quiet" or "mellow" ever? Thank goodness my new teaching partner and I became even closer friends than we already were. What doesn't kill a team makes it stronger! And yes a boss said in the middle of a staff meeting "Thanks for not walking out on us this year." Little did he know this was no where near my worst year teaching. Those were years 6 and 7 for sure! I get to go on my first business trip? How fun! Dyslexia conference in San Diego here I come! Midyear... want to become an instructional coach? Sure! Why not?! That sounds fun, but can I keep teaching? I don't really want to be an administrator. I'm a teacher because I like teaching kids! I don't ever intend to stop that. Oh, and by taking on that role I'm in charge of the Tech Team? Sure, why not?! 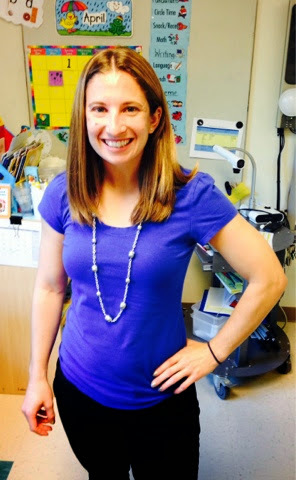 I'm a teacher, blogger, and TPT teacher who uses tech all the time. I could manage that. The last day of school was such a relief as all my hard work paid off and I received my Wilson Certification!! Yay me! Two college degrees and a total of 4 certifications! Wow! When did that all happen? 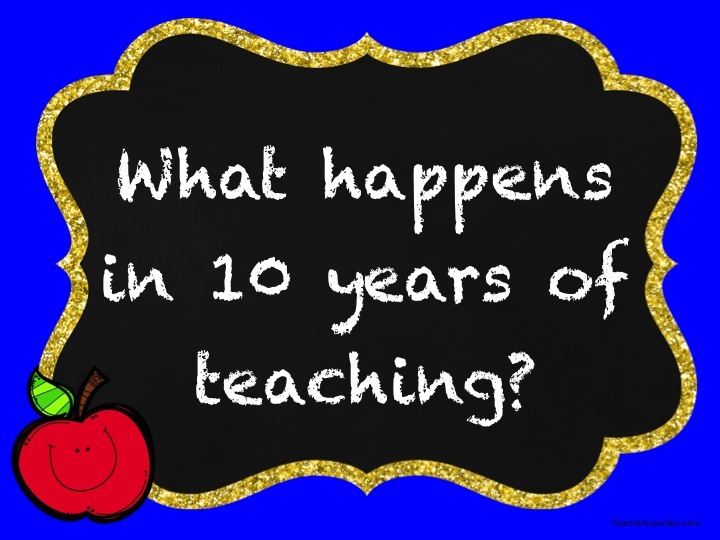 So begins my 10th year of teaching... and where has it taken me? I'm now a special ed teacher, instructional coach, and the leader of the Tech Team at school. I have also been tutoring students outside of school which has been a new adventure that I didn't plan on, but when fantastic families with adorable kids ask, I just can't say no. If you had told me during Year 1 what would be happening in Year 10, I never would have believed you! I never dreamed all my hard work would suddenly come together so smoothly and lead to so many amazing opportunities. I feel like this past month I've come to realize that all of my career ambitions have all come true. I can honestly say I don't know what will come next, nor for the first time ever I don't know what I'm aiming for. The sky is the limit from here. Time to embrace my role as instructional coach and build on my craft. I don't know what the future will hold, and I'm okay with that. I’m sitting at the 2014 IDA (International Dyslexia Association) conference in San Diego and loving every minute of it! I’m in teacher-nerd heaven here! By the end of Day 1 I’ve already taken almost 8 pages of notes! and I still have 8 more seminars to attend! The speakers are very intriguing and come from various different viewpoints to share an overlapping focus. I chose the comprehension-focused symposium for Day 1 of the conference. We are focusing on the brain, vocabulary, and in depth research about how comprehension is formed including the critical factors needed for strong comprehension. We also looked into the way sentence comprehension is far more complex than we tend to realize and the importance of appropriate forms of assessment to determine true comprehension ability. We’ve learned about how comprehension and reading affect the brain, which I found completely fascinating. Through my work and research for teaching students with dyslexia, I’ve learned about how the dyslexic brain works differently, but I’m now able to add to that knowledge the affects of reading comprehension skills on the brain. I never even thought to research comprehension and the brain! The imaging studies were so intriguing that I took pictures of the screens during the presentation. Last year I taught a Parent Education seminar about students with reading problems and the brain was one focus of my presentation. I’m so excited to be able to add to that portion of my presentation for this year! The sentence structure has a direct effect on comprehension of a reading passage. Students are often assessed on their ability to understand the overall meaning of a text, but less often instructed and assessed on their ability to comprehend individual complex sentences. She told us the intervention protocols she used to help students who were struggling, but unfortunately this is out of the scope of my current students. It's out of the current age range for our school since it was directed more for high school aged students, but it was interesting nonetheless. I'm planning to write a series of posts with the information I've learned. What topics would you like to read about more in depth? 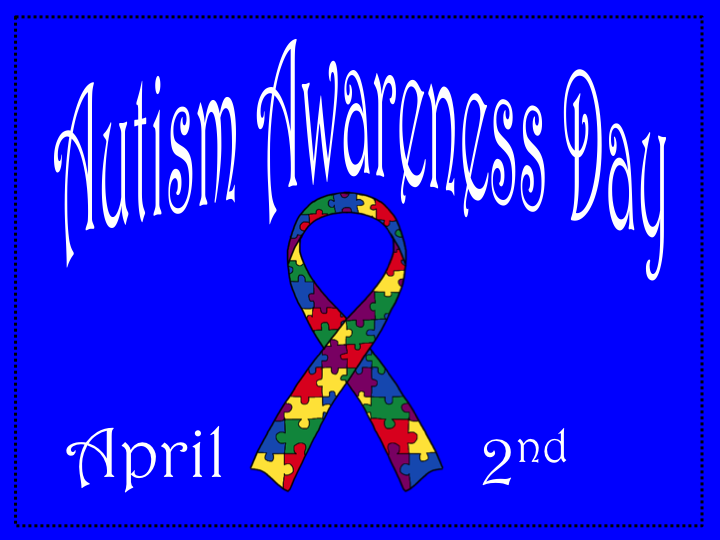 April is Autism Awareness month, which as you must know, is something very dear to my heart. Kids with autism are my favorite group to teach! They make my brain work in new ways, and constantly keep me on my toes. They also have a way of putting me in my place with their brutal honesty! Hahaha! Now it's time to spread my love of autism this month! 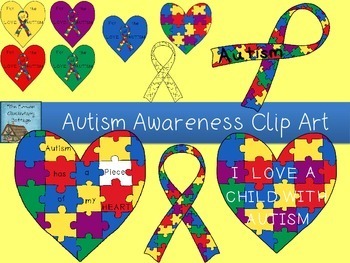 In honor of Autism Awareness, I've created a brand new set of clip art! This set includes images with and without words. 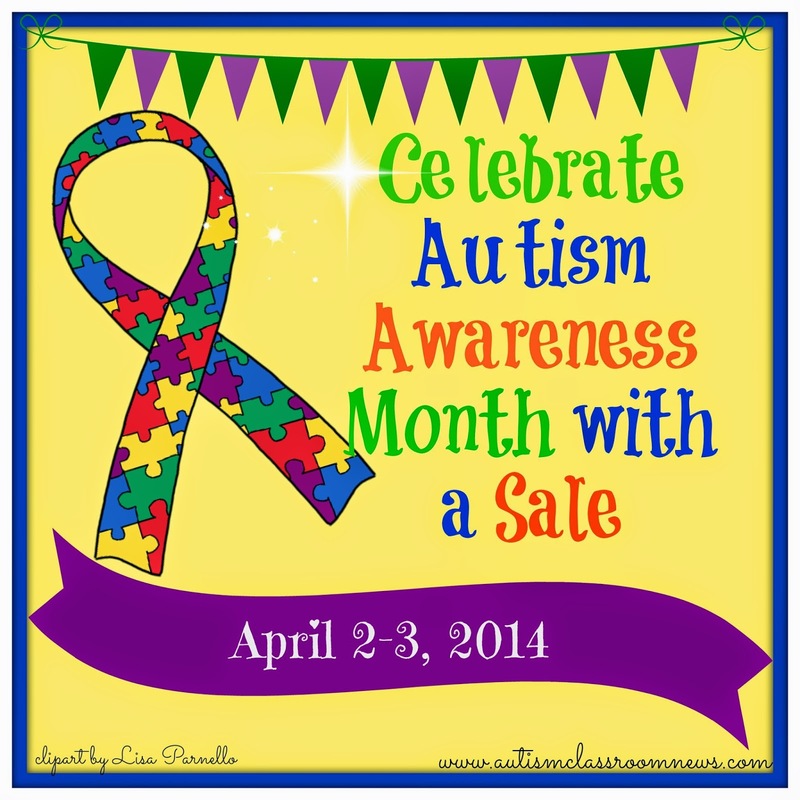 Also, Chris at Autism Classroom News has TONS in store for you this month. She has already set up links for free autism related items! Plus, I'm joining her in a special sale April 2nd and 3rd. 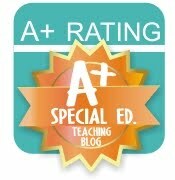 All of my special education products will be 15% OFF!! Chris made the most adorable sale banner using my clip art! 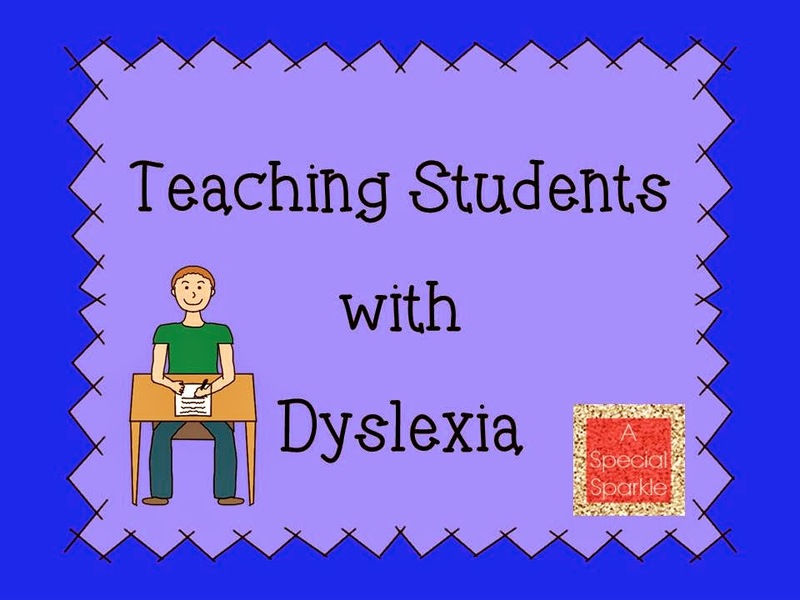 Don't miss my latest post on A Special Sparkle about dyslexia!! It's time for a Spring Cleaning TPT Sale! Everything in my TPT store is on sale for 20% off!! My store is on sale Friday-Monday! To see the full list of sale participants, please visit Georgia Grown Kiddos! 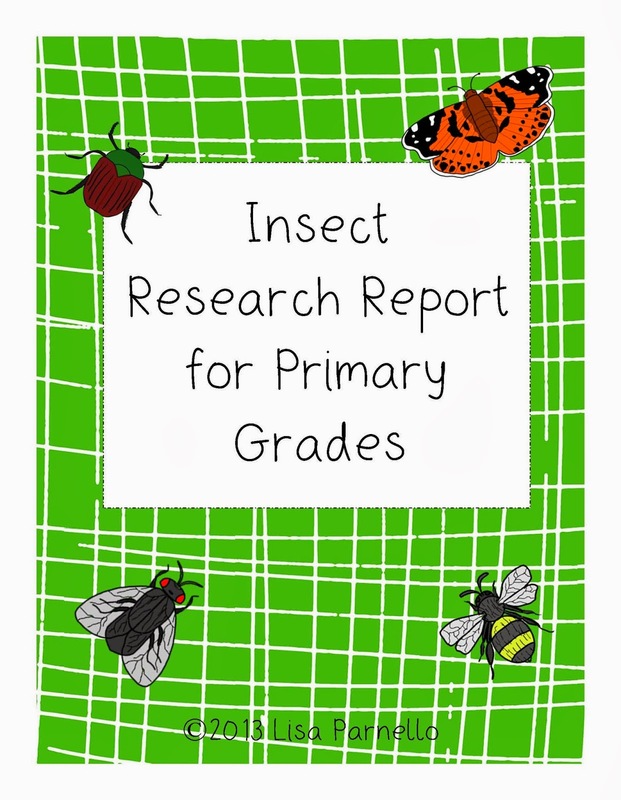 This would be a great time to pick up my new Insect Research Report for Primary grades! My class LOVED doing this project and they turned out completely adorable when we did this earlier this school year! Your kids will love it too. It's my favorite way to introduce students to the world of research projects. I simply lay out a pile of books and teach the kids how to find the information, rephrase the information, and cite sources in the bibliography. The students feel like such "big kids" by doing a research project! This was part of a much larger unit. Be on the lookout for the full unit in my store soon! This spring I am piloting not ONE but TWO different curriculum programs with my small groups. Each for a very different reason. I love my reading group! They are sweet as can be, but they are also students with disabilities and need more practice than the average group of kids. I hit a frustration point about a week ago when I saw my kids making progress but not enough to move forward. We have practiced the material so many times that the kids started to memorize words and it made it impossible for me to tell when they were really LEARNING something. I went to my assistant principal and voiced my concerns and out popped a new curriculum! Apparently it was already in the works to train some teachers on it, and we have some of the materials already. I was using Wilson FUNdations and it works for so many of our students, but not the ones with more severe reading challenges. Now I'm testing out the materials and using the Wilson Reading System. I am loving playing around with the program! Since I don't have the full system or the official training I get to make it my own for awhile! The kids think it's great because they get to do all this new stuff and they feel special that they are the only group that gets to do the fun new reading activities. Thankfully the two programs are by the same publisher and follow identical patterns and structures. It has been ridiculously easy to plop the kids into the new program! This is the new math program I'm testing out. The other teachers trying it out already love it but the publishers didn't originally send materials for my grade to try. I just got the samples today, so I'm excited to try it out starting next week! Have any of you used Number Worlds? What do you think about it? This year I changed jobs and it was one of the best decisions I've ever made. One of the perks has been my ability to expand my career horizons. As a teacher, it's very easy to see your life as A) being a classroom teacher forever or B) becoming an administrator of some sort. This job has helped me see that I have more options than that. One such option I've been able to experience has been parent education seminars. I know this may not sound thrilling, but when my whole world involves talking to 7 year old students in special education, my world can feel quite small sometimes. Yes, I have a life after work, but 8+ hours a day feels like my whole world some days. These seminars allowed me to use a whole other portion of my brain. After so many years of education experience, I take for granted how much I know and understand about children, reading acquisition, special education, and the reasons for why kids learn certain ways. My first seminar I was a small piece of a larger simulation. I loved every minute of it and would gladly do it every year. It had such an impact on the parents that I was simply in awe of how effective the seminar was for simulating the world of a child with dyslexia. Realistically it simulated almost all learning disabilities and the classroom challenges associated with it. You can read my full review and reaction to the experience HERE at A Special Sparkle. My second seminar was "Does my child have a reading problem?" which was to help parents identify signs that their child may have more than a typical struggle with reading. This was my first seminar where I was the main presenter along with a coworker who did it with me. I was beyond nervous, but it went quite well! We had little quizzes to get parents thinking and even a paragraph written by a child with dyslexia that they had to "edit" and figure out what it said. The story got the parents thinking and gave a great example for me to present the ways children with dyslexia make errors in their writing and the reasons behind it. There were moments where they asked questions and I instantly had the answers, which made me feel good about all the things I have come to learn over the course of my career as a teacher. There was one moment that caught me completely off guard and caused the room to go silent for a moment. One set of parents was Hispanic and raised their hand to ask a question. They struggled to find the words and ended up asking in Spanish out of desperation as they tried to think of the right words in English. Starting my career in Arizona, there were countless conferences I conducted in broken Spanish. When the parents asked the question, I repeated it in English and then spouted out the answer in Spanish without even thinking! They wanted to know if kids with Dyslexia had a harder time learning to read if they spoke 2 languages. After I answered that they may take longer, but of course they could learn, I had to giggle and explain to the rest of the group what just happened when I burst into another language without warning! I have a whole set of slides to share about reading disabilities, but I need to tweak them before I can share them with you. Right now they have boring backgrounds and lack visuals on some of the slides. The marketing team wanted the focus to be on the 2 of us talking rather than the slides. I need to make it more visually appealing before I show all of you! More to come!! Have you ever presented or attended parent education seminars? What was the topic?